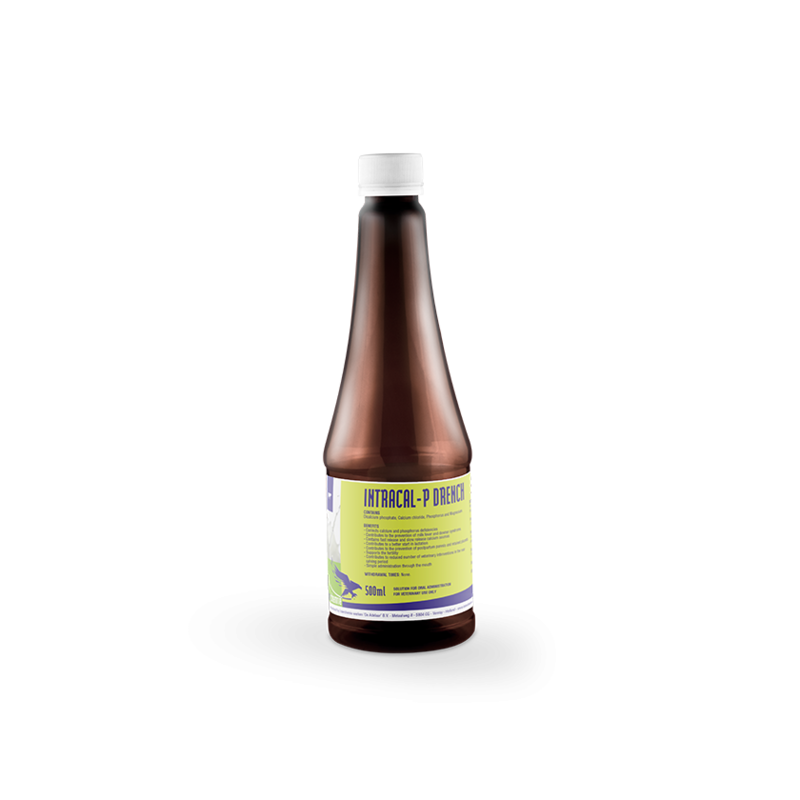 Intracal-P Drench - Ca-P-D3 Cattle Oral a 500 ml. Ca-P-D3 Cattle Oral a 500 ml. Intracal-P Drench is a liquid product for cattle, which supplement calcium and phosphorus deficiency. After parturition, the start of lactation period is followed by the secretion of colostrum. The daily feed ration is insufficient for the high calcium and phosphorus requirements after parturition, which is highly needed during this period. The lack of these ingredients result in milk fever (clinical or subclinical) in cattle. Milk fever is characterized by reduced blood calcium levels (hypocalcemia). It occurs following parturition, at onset of lactation, when demand for calcium for colostrum production exceeds the body's ability to mobilize calcium. Intracal-P Drench is made to supply fast release and slow release calcium in combination with phosphorus and magnesium, in periods of need. Intracal-P Drench can be used in order to prevent milk fever, for fertility support or for cows lacking appetite. For oral administration in cattle. For extra cow support it is optional to administer 1 bottle Intracal-P Drench 12 hours before calving. 1 bottle directly into the mouth 3 to 4 weeks before mating. 1 bottle directly into the mouth immediately after calving, a second bottle may be repeated after 10 hours. 1 bottle daily directly into the mouth, until appetite recovers.